So, fulfilling my initial plan, I visited six retail stores among which there were both nameless POPs and large specialized shops, including Nokia’s own-branded store – probably it’s the best point to start the story with. In Nokia’s retail store the shop-assistants were excited about something on their computer display, supposed to be very interesting as I even had to insist on getting some attention of theirs. Having asked for the advice in searching for a headset I got a quick answer from the shop-assistant who promptly found his bearings and suggested to buy the BH800 for a present. He motivated: «It is a stylish headset with noise and echo cancellation technologies and a cool silvery carrying strap, included in the sales package». As you might have guessed, I had nothing to do but repeat my requirements one more time, emphasizing that I was in desperate search for a high-quality headset though would handle calls, rather everyone’s eyes on it. It couldn’t be helped, though, as I got the BH800 as the only option on the short-list again. 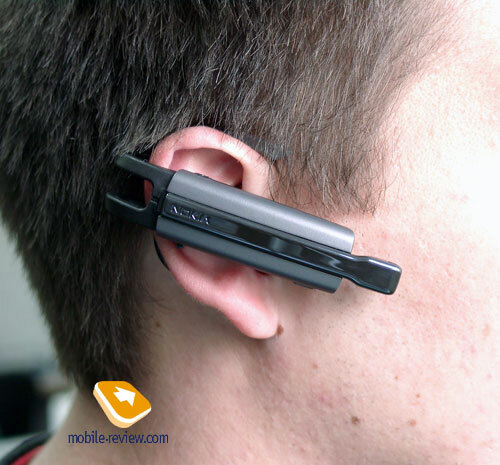 So I had to throw out hints at the BH900 myself, which were countered with the following amusing statement: in reality the headset proved to malfunction with some Nokia-branded handsets, so that the BH800 was the best offering to pick. To my thinking, this headset is not that bad at all, however but it loses much to the reviewed headset on speech transfer quality. Moving on to the next shop – this time, a nameless one. First of all, I have to say that in such stores assistants possess even deeper insight in what they sell, as often they intensively test headsets and can share many interesting thoughts with you. The explanation is nothing special, though – as a rule they work not for nobody but themselves, so that learning more about the offerings placed on the shelves is vital. Having asked the shop-assistant the same question, I got the following short-list: Jabra BT800, Jabra JX-10, Plantronics Discovery 640. As for the BH900, he told me it might be good as well, but Plantronics would be a smarter choice. Retail store «Svyznoi» (now without falling for preambles I’ll just list the suggested range of products). The girl there advised me to go for Jabra BT-200, Jabra BT-250, Nokia HS-11W (!!! ), SonyEricsson HBH-608. 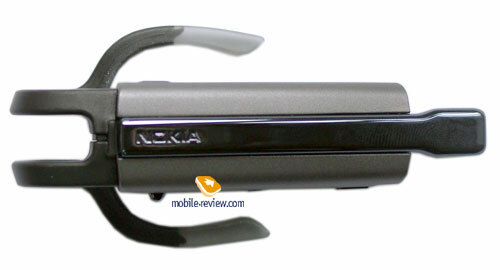 Nameless store – Nokia BH900 (at last! ), Nokia HS-12W, Sony Ericsson HBH-608, Jabra JX10. All praise the shop-assistants in nameless stores. Retail store «Euroset»: “Broadly speaking, pick anything you like or let your boss choose himself. The more expensive - the better and in general they are all the same” – that was the advice I heard from a girl over there. As a matter of fact it’s a relatively justified point of view as the most expensive headsets were the BH-900 and gadgets by Sony-Ericsson. Nameless store – SonyEricsson HBH-610, 610a, GV-435, IV-835 (reviews on these, except for the last device, can be found on our portal). As for the BH900, the assistant said without any explanations that it would be better to buy SE – just better and that’s all. Summing up everything said above, I can state, that all my fantasies on sliding boom mic being an eye-picker and a trump for the BH-900, advertised by shop-assistants, didn’t come true. 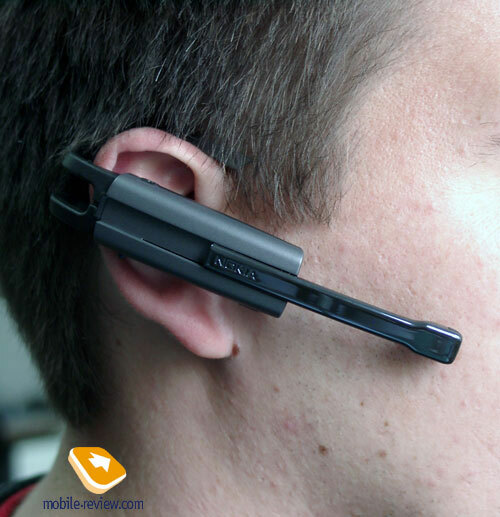 Due to the following reasons the headset isn’t proposed too intensively – high price, possible issues with pairing up with non-Nokia headsets (a cliche cannot be wiped that easily), and sliding boom microphone being truly unusual and new to the market. To my thinking, the gadget’s design retains more of appealing curves rather than repulsive ones – personally, I find it good-looking. Basically, it comes as no surprise, as I favor clamshells and sliders, some other devices with moving-sliding-springing parts, which could be closed or opened; it is scientifically proven (the market says the same) that I’m not the one liable to that sickness. The BH900 is a domain for all trinkets lovers: slightly touch the mic and it slides in and out easily, barely audible click tells you it has taken this or that position. To tell the truth I expected the boom to be metal-coated, however it turned out to be made of opaque plastic. 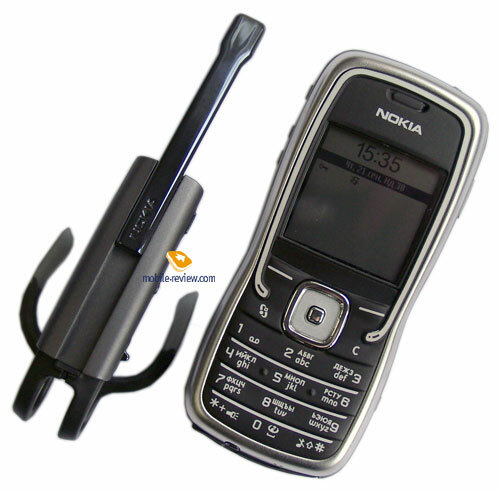 To my mind, it wouldn’t be too hard to enhance the casing with some “heavy-metal” parts, so we would get a mono-headset similar to Nokia-HS12W, which would add a lot of points to the BH900’s bank, for lack of headsets making use of such materials. Also the trim, or better to say, the mix of grey and taupe, looks elegant and eye-candy. Subjectively the design is extremely cool so that the device leaves an impression of an expensive gadget. Build quality delivered by the BH900 lives up to the manufacturer’s brand – no gaps or grooves, the boom doesn’t dangle around either. The BH900 is sure to be a male-targeted headset, as the women I asked disliked it for color and size. 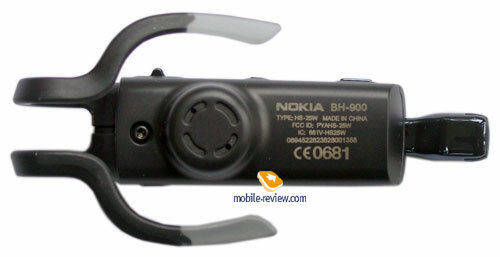 The mounting applied in the BH900 is the ear clip found on Nokia-HS11W. When I had put the headset on for the very first time I felt a bit of pain, although the next day my ear got used to the device and the headset didn’t hurt my ear anymore – this goes for both left and right ear even on long wearing sessions. 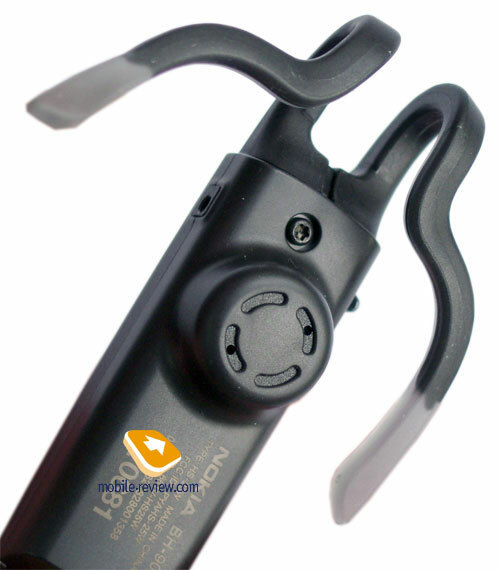 The clip is incredibly reliable, making sure the headset doesn’t fall down at jerking, which allows using it for sport activities. For some people, the slid open microphone may end up on their cheek, though I didn’t experience that; the boom doesn’t hit your cheek when walking or stirring. So in a nutshell we have a safe and handy ear clip, easy-to-wear design (the first try-on might cause some problems), which is much simpler to put on than most ear loop equipped models. The BH900 gets along with glasses as well – I succeeded in having both items on me at the same time. Personally, I really liked the headset’s controls. There are three stand-alone buttons – multifunction key (answer/end, switching between phone and handsfree modes, redial, and voice dial activation), volume control button, following in the footsteps of Sony’s JogDial in terms of style, power button. Apart from these keys, the sliding part has much do to with call management – sliding it open/closed doubles as pick/hang up. The buttons offer soft clicks – getting used to them takes a little time. The LED is quite tiny, yet its precise location outweighs that drawback. The headset retains a 160mAh Li-Pol battery whose claimed lifetime in talk and standby modes is 8 and 180 hours respectively. Though I have to make a note on usage of similar batteries right away: if it is -20 outside, don’t even try to have long headset-powered conversations outdoors, otherwise your unit will have only one straight way – to the junkyard, since the battery is non-removable here and the warranty repair still comes down to the rule “it’s better to get a replacement than do repairs». On top of that, no repairs can be made at all, as updating firmware can be handled by any user even at home (for example such feature is provided for Jabra BT800), but digging into the hardware filling is a horse of a different color. In practice the talk time is close to the claimed figures; it’s a «long-lasting» product, which easily managed to offer five days of operation on average load (20 minutes of calls a day, offline mode at night). On the whole, the BH900’s lifetime is pretty good, as it makes you forget about seeking for the nearest wall outlet to recharge it. The device retains «slim» charger slot, so the owners of Nokia-branded handsets with similar sockets will be able to use the same charger. 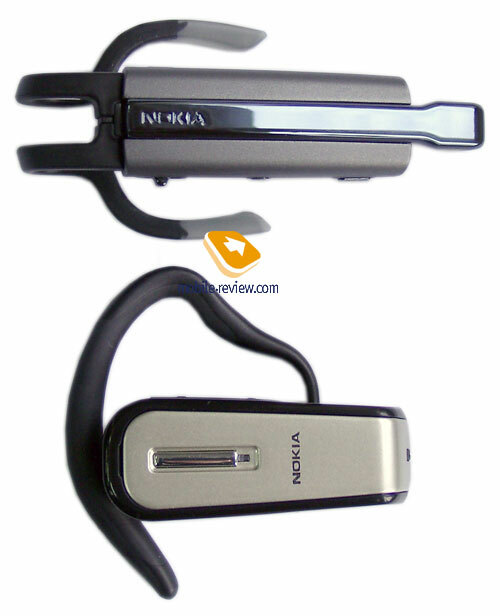 The headset was tested out in pair with Nokia 5500. To couple the devices, the headset doesn’t need to be turned into any special mode; it’s enough to have it switched on. Detection and adding onto the list of authorized devices doesn’t cause any troubles either. The headset comes equipped with DSP processor providing the following benefits: flawless speech transfer quality so even in noisy environments your interlocutor gets every last word of yours and you hear him perfectly as well. It may seem surprising, but some people on the other end noticed that the sound in the BH900 was better than that of the handset. In my opinion it is caused not only by noise reduction and echo cancellation technologies but also by pulled out microphone, which is close enough to your mouth; so I believe that even without DSP the speech transfer quality would be admirable. When the microphone boom isn’t slid open, the sound gets a bit worse, especially when talking in noisy environments, however should you find yourself in relatively quiet room speech transfer quality becomes not a real issue. Interlocutor’s voice has a very nice timbre which is similar to that generated by a handset’s loudspeaker. I didn’t notice any malfunctions concerning the headset’s operation, however there was a tiny detail that I didn’t like – voice dial, as it might take your more than two times to pronounce the required contact’s name correctly. The handset itself might be the problem, though and if this is the case, the headset is not the device to be blamed. Almost the same holds true for Skype - sound quality proves to be acceptable, especially with the microphone slid open. On the whole if somebody has already had a chance to get his hands on Jabra BT800, all I have to do is say that the BH900 puts up even better performance. And I’ll notice it outright that Nokia’s device does lack silent alert and a display for service information, which would really make the headset truly marvelous, adding a couple of extra (and very significant) advantages. It’s quite possible that such solutions would cost more coins, but I suppose a person looking for a premium-class solution for wireless communication wouldn’t be frightened away with price. 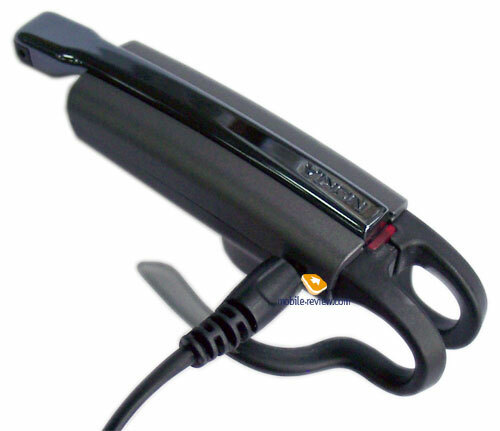 In my opinion the BH900 could be used as the base for a headset equipped with all the latest-and-greatest solutions of the wireless telephony; though even nowadays the device is a powerful a threat to the headsets with DSP technology onboard by Sony Ericsson, and the addition of the abovementioned features would add a whole lots of points to its image. However these are just personal thoughts of mine, and getting back to the reality, I’m to give the BH900 a very high mark for sound quality. -Missing metal parts, even though consumers expect exactly details made of metal, having looked at the photos. Nevertheless I have to say that the BH900 is a very appealing headset, winning on being easy to use and offering good speech transfer quality. And what is more, due to such unusual design and mounting it is nearly beyond competition - Sony Ericsson HBH GV-435 is the only rival of the Nokia’s offspring coming to my mind, but having similar unique ear loop, its loses to the BH900 in terms of speech transfer quality. As it usually happens when it comes to DSP-powered solutions, the headset is rivaled to certain extent by Jabra-branded devices – the BT800, the JX10 and SonyEricsson HBH-610, 610a.